Today’s Leg 3 of the Silk Way Rally signalled the start of demanding long distance cross-country rally driving. 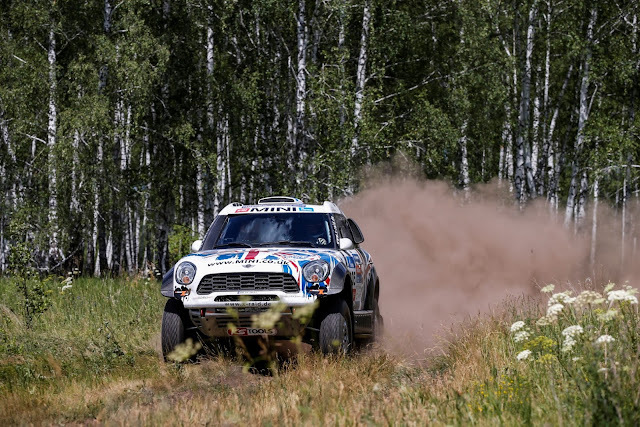 After the short but spectacular Special Stage of Leg 1, the five MINI ALL4 Racing crews were keen to show what they and their MINI ALL4 Racing were capable of from the start of Leg 2 (10-07-2016). Unfortunately, the previous days of rain had caused many of the route tracks to flood. With the threat of yet more violent storms forcing the support helicopters to remain grounded, the Silk Way Rally organising team reluctantly had to cancel Leg 2 and the competitors drove orderly to Ufa for today’s start of Leg 3. Leg 3 saw some fast driving across mostly gravel tracks and resulted in the MINI ALL4 racing #103 of Yazeed Al Rajhi (KSA) and Timo Gottschalk (GER) completing the section in second position. . .